The Borough bandwagon marched on last Saturday with a well-earned victory against in form team Cottesmore. 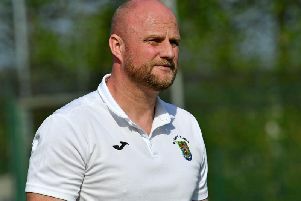 It’s all too early at this stage to call where the team will be at the end of the season, but Manager Ady Fuller was pleased with his troops. The game started at pace and it was Borough who camped themselves in the Cottesmore half, Brandon Oddy being the instigator of most attacks. A great move from Borough completely opened up the Cottesmore defence and an attack on 27 minutes gave Borough the lead, Sam Beasley steaming down the left and some good interplay from Tommy Glasscoe and Ryan Byrne saw the latter cross; Josh Turton timed his run perfectly to nod home his fourth goal in four games. Borough went for the kill then, attack after attack saw Kane Finney shoot wide after a great run; Jamie Paye head into the keepers’ arms, and a Glasscoe shot look destined for the top corner, only for the keeper to make a great save. Borough continued the second half where they left off and on 54 minutes increased their lead when Aiden Print crossed for Paye; he took his defender out and rifled a right foot shot into the corner. Paye again had a chance to make it three with the keeper making a good save, but on 64 minutes Oddy got the goal that he deserved, stooping low to head home a Beasley cross to the delight of his teammates. Luke Pritchard came on for Byrne and Joe Taplin came on for Oddy, and on 64 minutes Olly Chater made it four, sweeping home a cross from the impressive Glasscoe. Late on Paye, Chater, and Pritchard had chances to add further goals but all came to nothing. Mention must go to Jack Tregartha in goal for the Borough, who didn’t have a lot to do, but when he was called on, he did it well. There were two outstanding performances from Aiden Print and Tommy Glasscoe, who were both immense in defending and support for the front line when required. Borough take on Ellistown this Saturday in a Premier League Fixture the game will be at Kilsby Lane with a 3pm kick-off. In the Coventry Charity Cup draw Borough will host Coventry Plumbing in the Quarter Finals and that game will be played on Monday, December 3 with a 7:45pm kick-off.